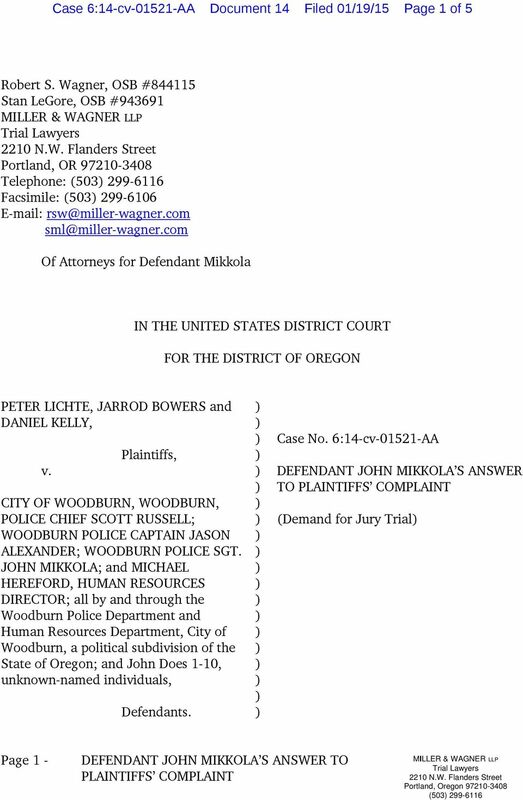 Download "Case 6:14-cv-01521-AA Document 14 Filed 01/19/15 Page 1 of 5"
UNITED STATES DISTRICT COURT DISTRICT OF OREGON PORTLAND DIVISION. Plaintiff, Defendant. JURISDICTION 1. Case 1:14-cv-01323-ERK-JMA Document 1-1 Filed 02/27/14 Page 1 of 2 PageID #: 6 CIVIL COVER SHEET (SEE INSTRUCTIONS ON NEXT PAGE OF THIS FORM. IN THE UNITED STATES DISTRICT COURT FOR THE WESTERN DISTRICT OF VIRGINIA LYNCHBURG (CHARLOTTESVILLE) DIVISION. 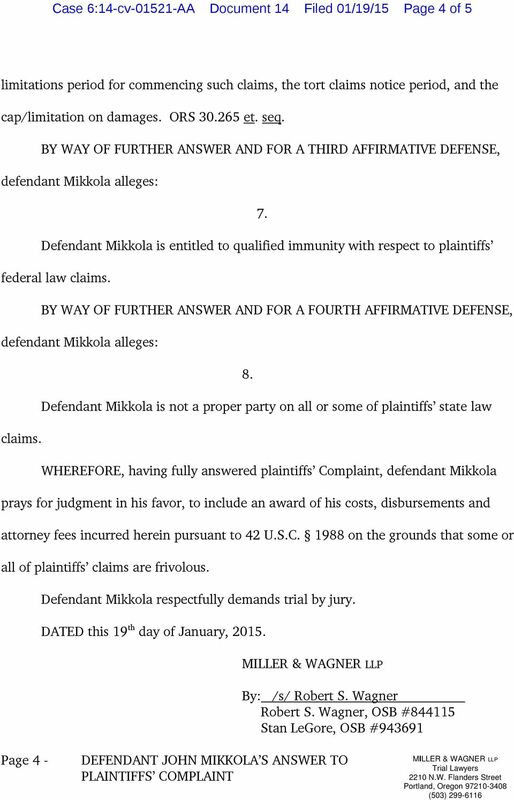 Plaintiff, Case No. v.
Case 3:15-cv-00012-CAR Document 9 Filed 05/08/15 Page 1 of 11 IN THE UNITED STATES DISTRICT COURT FOR THE MIDDLE DISTRICT OF GEORGIA ATHENS DIVISION MELISSA BROWN and BEN JENKINS, ) ) Plaintiffs, ) ) vs. 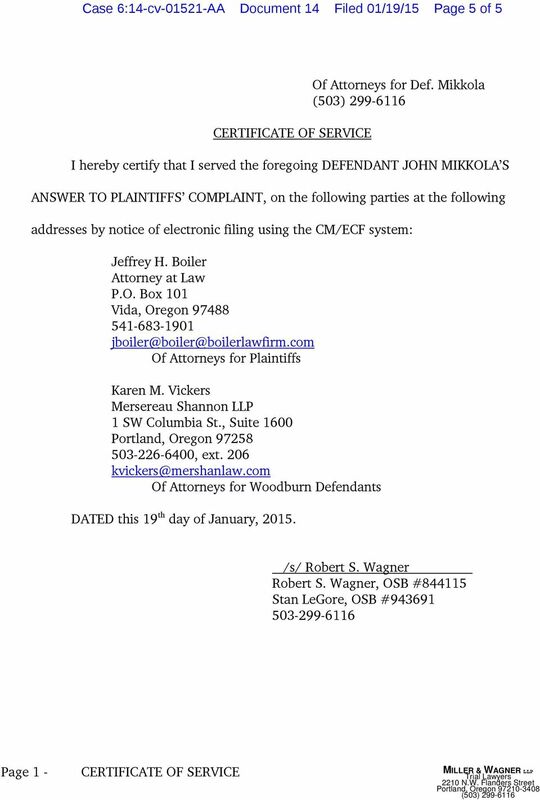 The Defendants, by and through counsel, the Office of the Attorney General, submit the following Answer to Plaintiffs Complaint. 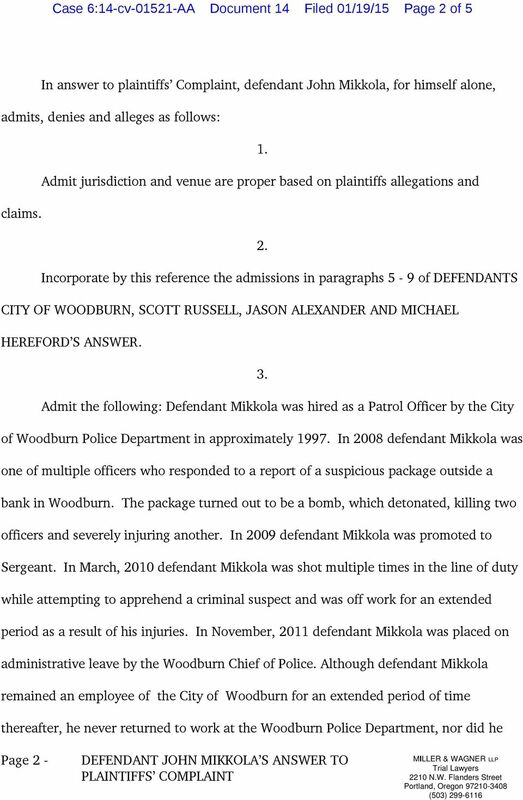 Case 9:15-cv-80366-JIC Document 1 Entered on FLSD Docket 03/19/2015 Page 1 of 7 UNITED STATES DISTRICT COURT SOUTHERN DISTRICT OF FLORIDA. Case No. Case 9:15-cv-80366-JIC Document 1 Entered on FLSD Docket 03/19/2015 Page 1 of 7 UNITED STATES DISTRICT COURT SOUTHERN DISTRICT OF FLORIDA ARRIVAL STAR, SA, and MELVINO TECHNOLOGIES LIMITED, Case No. : v.
TERRENCE and Marie Domin, Plaintiffs, v. SHELBY INSURANCE COMPANY, a foreign corporation, Defendant. IN THE UNITED STATES DISTRICT COURT FOR THE SOUTHERN DISTRICT OF TEXAS HOUSTON DIVISION. Plaintiffs, C. A. NO. VS. Document Page 1 of 15 IN THE UNITED STATES BANKRUPTCY COURT FOR THE EASTERN DISTRICT OF VIRGINIA Alexandria Division ) In re: ) Case No. 07-11440-RGM Ronald Steven Federici, ) Chapter 7 Debtor. ) ) ) W.